On my bedside table I have three books. The three book covers hint at a common theme. Colour? Red, red and red. I am preparing myself mentally for a journey into the “Big Red Bit” in the centre of Australia. I will not be alone, unlike the intrepid Robyn Davidson in “Tracks”, the book on the top of the pile. Robyn travelled across 1700 miles of Australian outback with only three camels and a dog for company. I admire her. Being somewhat less intrepid myself, I will have my husband Richard with me, and for most of the trip we will be with a group of friends and neighbours from in and around Deans Marsh in the West of Victoria. Robyn’s book has helped me with a few tips on how to break in a camel (could come in handy) and has conjured up something of what it is like to be in the red centre of Australia. It’s not possible to sum up this landscape in a few easy words, says Robyn. “It is difficult to describe Australian desert ranges as their beauty is not just visual. They have an awesome grandeur that can fill you with exaltation or dread, and usually a combination of both.” Wow! Awesome in the truest sense of that much maligned word. The second book is Vic Widman’s “Travelling the Outback – the complete guide to planning and preparing for your outback adventure”. It’s a very practical source of information on anything and everything you need to do to prepare for a trip. The chapters on Camping Gear, Food & Water and Personal Needs have been particularly enlightening for me. “There is really no need to do without anything on your camping holiday”, says Vic before covering showering and toilet facilities when travelling. Important stuff indeed! Richard has spent somewhat more time leafing through the Preparing The Vehicle section. More about that in future posts. The Simpson Desert is the most remote area we plan to visit and warrants a book to itself. Mark Shephard’s “The Simpson Desert – Natural History and Human Endeavour” is a real gem. This is THE book on the Simpson desert. It is full of gorgeous, evocative photography and a wealth of detail on the history and nature of this unique part of Australia. The dedication at the front of the book took me aback, it reads “To my son Matthew, who was fortunate to be able to experience the desert before he was one year old”. That must have been quite a family holiday! 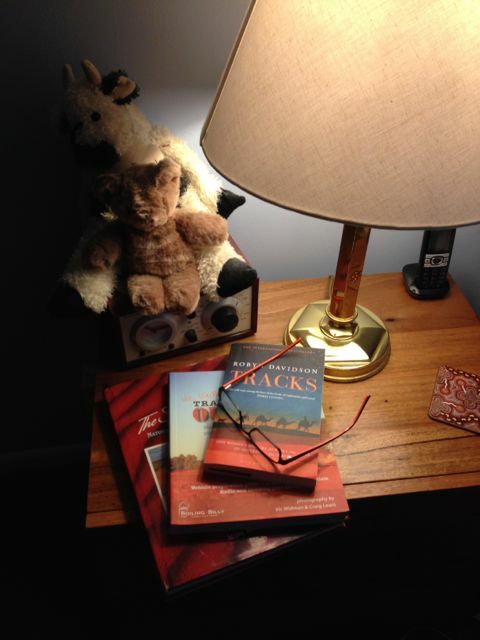 I can’t compete (and don’t intend to) with the illustrious writers of these books, but in a small way this blog will add to the literature describing travels into the Big Red Bit in the centre of Australia. I hope it informs and entertains anyone who stumbles across it and is interested enough to spend some time reading here. I liked the quote by Martin Buber that I’ve used as the title for this post. I hope you do too. It reminds me that no matter how well we plan for the journey, it will take on a life of its own and who knows what its secret destination may be. We shall be following you every step of the way, delighting in the fact that our journey is virtual!